Every other mutual fund I have ever owned has at one time or another paid out dividend distributions.This includes funds that I have held on my own, and some that were held in Traditional and Roth IRA’S. Not so with any funds I have had in two 401k plans over the years. Going all the way back in my annual statements I cannot find a single entry for dividend distributions. Do you have any ideas why this might be so and whether or not I would be better off making contributions to an IRA that go above and beyond the company match?? There are several ways that I’ll attempt to answer this. Keep in mind, I’m not a financial planner, or a financial adviser, so take what I say with a grain of salt. Perhaps a few of my adviser readers will have slightly better advice, we’ll see. I think there are really two questions there though (I won’t charge you extra. ), so let’s break it down a bit. Several things could be happening here, but here are the most likely scenarios. Because of the difference in how a 401(k) and an IRA are handled for taxes, (401(k) is pre-payroll tax while IRA is post-payroll tax) the tax that you would normally pay on a dividend distribution is deferred in a 401(k). What that means is that the dividend income in a 401(k) doesn’t have to be reported and is usually automatically reinvested. Depending on the 401(k) provider, dividend income might just be being shown as a capital gain on the fund since that’s what it becomes in this tax scenario. Another possibility (although somewhat unlikely) is that, like stocks, not all funds will pay a dividend. The only way to figure that out is to do some research into the individual funds that you own in your 401(k) and determine if they pay a dividend or not. I like finance.google.com for quick lookups, but the best place would be the website of the fund, or the prospectus for the fund. I wanted to tackle this question separately. First, you should, absolutely, take advantage of your company match to it’s full extent. If your company will match x% up to y% of your income, you should contribute y% at a minimum. It’s free money, and I guarantee you the company looks at it as a part of your compensation package. You wouldn’t leave a paycheck un-cashed would you? Once you’ve met that amount, several things come into play. I think the biggest of these is your personal tax situation. A 401(k) acts as a deferred tax account. You don’t pay any taxes on your contributions, and then pay taxes (at your then tax rate), on the withdrawals. With a Roth IRA, you pay taxes on the contributions, but not on the withdrawals. Let’s say you make a lot of money now, and your tax rate is 35%. When you retire, you’re no longer making those fat stacks of cash, and your tax rate drops to 25% or less. You’ll now pay 10% less in taxes on those withdrawals. Keep in mind that those withdrawals will include any capital gains that the account has accrued over your working career. In the Roth IRA, you’ve already paid the taxes on contributions at 35%, and you don’t pay any taxes on the withdrawals. In this scenario (10% drop in tax rate), you’ll need to have managed gains of 10% above your contributions by the time you retire to realize any significant difference. Another thing to look at, is whether you are able to contribute to the limits. 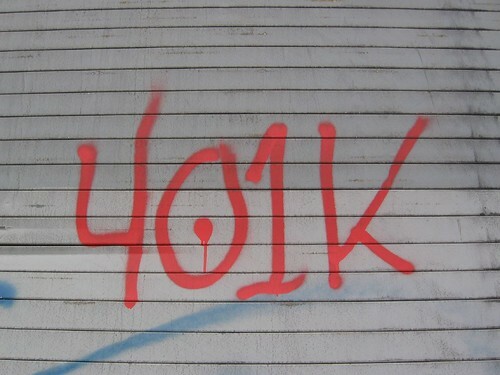 In 2012, the 401(k) contribution limit is 17,000. If you’re 50 or older, you can also make an additional “catch-up” contribution of $5,000, for a total of $22,000. There’s an additional overall limit of $50,000 for employee plus employer contributions. So, if you make the max contribution, your employer can only contribute the additional amount to $50,000. For the IRA, the maximum annual contribution is $5,000 (or $6,000 if you’re 50 or older). There are also some restrictions on how much of the contribution is tax deductible, and how much can be contributed based on income. The simple suggestion here is that you should contribute to your 401(k) up to the % that the company will match to take full advantage of that added compensation. Once you’ve hit that %, contribute to an IRA up to the full amount you’re allowed. Once you’ve hit that contribution limit, invest any additional contributions into your 401(k). Obviously, it takes a bit of math to figure all of that out, since you won’t likely know whether you’ve hit the max on the IRA without some pre-planning. But, if you can manage to sock away the $5,000 (or $6,000 if you’re older than 50) into a savings, you can write one check at the beginning of the year as your current year contribution to your IRA, and then take whatever you’re comfortable with out of your paycheck for your 401(k). Using a tax refund as a boost to the IRA contribution can be helpful (if you get a refund). That’s a very high level overview of the IRA vs. 401(k) question though, and you really should consult your accountant or a financial adviser on the subject. There are lots of factors that go into the the tax ramifications of both, and you really want to know as much as you can so that you can adjust your retirement planning accordingly.